With Purim just around the corner, we’re highlighting some of our favorite unconventional hamentaschen recipes! Rob Eshman of Foodaism shares his Palestinian-Chinese version with us. Enjoy! Ma’amoul are semolina butter cookies stuffed with dates and pressed into a decorative round mold. I’ve eaten them at Moroccan Shabbat tables, Palestinian weddings, Lebanese and Turkish restaurants. They are a Mideast staple during the Muslim Eid holiday and Easter, and the Jews of Egypt bake maamoul during Purim. For my version, I started with a recipe from the beautiful new Palestinian cookbook, Zaitoun, by Yasmin Khan. Both the dough and the filling use rose water, which I don’t much like. So in the dough I substituted grated Meyer lemon peel—a tree grows outside my kitchen– and in the filling I used local brandy. The brandy balances the sweetness of the dates, and anyway, on Purim, you’re supposed to drink. Ma’amoul are round. 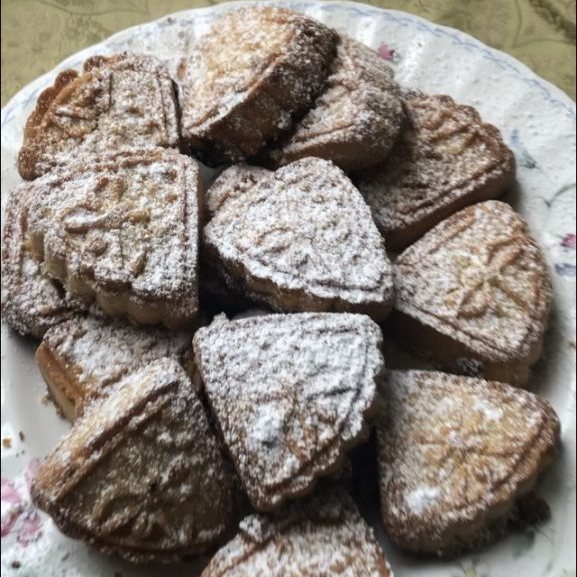 To transform them into hamentaschen-like triangles, I used a Chinese mooncake mold (available on Amazon). The filling hides inside—so appropriate for a holiday whose central story revolves around hidden layers of multiple identities. So, let’s review: this is a Middle Eastern/North African cookie from a Palestinian cookbook written by a Persian-Pakistani author and adapted by an American Jew, substituting some local Southern California ingredients and formed in traditional Chinese molds. If that doesn’t scream, “Happy Purim!” what does? Make the dough. Mix the semolina, flour, salt, lemon peel and butter in a food processor or by hand until crumbly. Add milk and water and pulse or stir until a dough forms. Gather, cover and refrigerate one hour. Make the filling. Pulse or finely chop and stir all ingredients together into a rough paste. Refrigerate 30 minutes. Divide dough into 24 pieces. Roll each piece into a ball, then make a small indentation with your finger, and stuff in some filling (about ½ -1 tsp.) and cover and reform into ball. Place ball inside triangular mooncake mold, press, and release. Bake at 400 degrees for 20 minutes or until golden Cool and dust with confectioner’s sugar. To learn more about Rob Eshmen and Foodaism, visit www.foodaism.com.